A revised Paper Sled had a few brief hops to start with, before I concluded that it needed even more tail and possibly a general scale-up in size as well. But the main aim was to pull out the MBK Parafoil to see how it went with drogue removed! The hope was to put the kite up in fairly light wind and base the whole outing around that kind of flying. Instead, the breeze was very gusty and peaking around 25 kph. Puffy cumulus clouds were all around and it soon became clear that the kite was in for a wild ride. Initially, I spent some time trying to trim out a tendency to hang left and even loop tightly in that direction at times. The Parafoil did not respond readily to small adjustments and the direction of shift required turned out to be opposite to the usual. One of those kites where changes in drag have more effect than changes in lift when you shift the towing point sideways. Anyway, eventually, up it soared. Having achieved success on 30 meters, the line was extended to 60 meters (200 feet). Occasionally the kite got forced down low as fresh gusts ripped through and spun the Parafoil one way or the other. No drogue remember. With excessive wind, you can't always trim a kite out! At other times, sinking air caused the line angle to decrease while the kite sat stable but pulling hard. And of course, the flip side to that also happened - glorious floating, weaving flight at steep line angles as the kite negotiated large regions of rising air. A flock - no, 2 flocks - of white Corellas wheeled around, merged together and flew right over the kite. Checking it out through sheer curiosity I suspect. Other small birds darted here and there, taking less notice. Finally, after taking some video footage with a little zoom, it was time to take it to the limit on 90 meters (300 feet) of line. And it was about the limit for the reserve I was flying in. Several times evasive action had to be taken as the kite came close to being forced down into large trees. It was hairy up there! So, it can be concluded that the MBK Parafoil, if well made and trimmed, will successfully fly well into the Moderate range of wind speeds with no drogue attached. Pausing on the concrete steps halfway down to the sand, the breeze was measured with the wind meter. The spinning cups indicated around 15 kph and gusting to 19 kph. That was close to perfect for this kite, although the wind strength would measure slightly lower down on the beach. With it's drogue already attached, the new Parafoil popped effortlessly into the air straight after the flying line went on. A couple of guys walking along the beach had seen me attaching the line and at first thought I was doing a spot of fishing! Plenty of photos were taken, from various angles as the kite flew on only several meters of line. The smooth south westerly was making the job easy. Picking up my bag and the winder while the kite continued to float, it was also easy to find another spot to fly. Down the beach a bit, where the background had some interesting features. At the reserve, a line of massive cumulus clouds rose past a line of trees at the far boundary. With the kite on a short line I was able to take photos from some higher ground to get a more picturesque perspective. Finally, with around 60 meters (200 feet) of line out, another movie was taken. Arriving home, an online check revealed that the air near that location had been moving at 18 kph and gusting to 22 kph. However, it seemed like there was some lively thermal activity going on as well. Hence the Parafoil might have been hit with significantly stronger gusts from time to time. I'm glad the packing tape held since the line sometimes went very tight with the kite up over 100 feet! Down at a beach yesterday, the breeze was cold and fresh. Not to mention much smoother than the previous outing where it was only gusting into the fresh range. To begin with, the MBK Parafoil was unpacked. As usual, a small drogue was attached to the center of the trailing edge. After some trouble with the kite flapping about in the rough air downwind of my body, I finally got the kite away cleanly. Forgot to check the line tension this time, but perhaps it was a little more than the usual 1.5kg or so. In any case, that was no problem for the 20 pound Dacron line and small sand anchor to hold. After this, the smaller Soft Sled was tried. I say 'tried' since it didn't cope at all with air moving at over 30kph for even 10 seconds or so at a time. The ram-air spars just gave up, time and again, allowing the front end of the kite to fold right up. It was surprising, since this little kite has done well in quite windy inland weather. Right up to 300 feet or so. Just goes to show how much energy there is in smooth fast-moving air! The bridle attachments again? No, as it turned out. This time a taped seam along one side had given way. Round and round the kite went before lodging into a prickly bush, causing a small slit in one keel. This incident prompted a design change - more use of wide packing tape over those side seams! Back from the drawing board. Or rather, from online image search for various flat parafoils! Just been out for a very successful test of the latest keel/bridle configuration for the Parafoil. Despite only occasional puffs of breeze sufficient to launch the kite, it flew stable without any tail - and to a very respectable angle on about 60m (200ft) of line. Experimentation is progressing on new keels and bridling to get the MBK Parafoil flying smoother. The side keels are now much deeper, with bridle attachment points much further aft than on the original 3-point bridle design. However, it's now a 6-point design with the extra 3 right on the leading edge of the lower sail surface. After a couple of adjustments today, the parafoil + thin Tyvek tail flew very smoothly in moderate winds. However, the leading edges of the side keels balloon out excessively and occasionally one side flops inwards, putting the kite into a turn. It's clear the bridle lines need to be much longer, as is helpful for Sled kites. I'll try shifting the forward bridle attachment back down the keels a bit too, to keep those leading edges under control. Before leaving home, the online weather was consulted to confirm whether it was a good day to exercise the final Parafoil design in Fresh wind. Indeed it was! Sunshine and all. On arriving at the field, the kite was soon in the air, trailing the usual small orange drogue. Some video was taken while the kite demonstrated it's ability to recover in very rough air, on a short line. Fresh gusts blowing through and over leafy trees upwind, you see. With the camera threatening to lose power, I let out the line to 30 meters (100 feet) and took some more footage. This time from one side and from more underneath the kite. It was gratifying to see the Parafoil reasonably steady and smooth as the wind strength crept up and up. The drogue was working hard though. It was time for more altitude! 400 feet or bust. Well, bust it was actually, just short of 300 feet off the grass. As already mentioned, a bridle line attachment point let go... The kite, flapping an injured wing, limped around in circles until gently contacting the ground. On arrival at the field, the first challenge was to unfurl the drogue without letting the kite blow away. A few moments later I just launched the kite and let the drogue line unwind by itself. So, the double-blue parafoil was soon floating around close to the ground while I took a short movie. This prototype has much less rake-forward of the air inlets. Also, it employs copious use of wide packing tape along all the seams near the leading edges. Consequently, the kite would pop open easily and hold it's shape without collapsing at the first small jerk on the flying line. Towards the middle of the field, someone else was flying a small retail Delta Conyne. Being partly cellular, the kite was doing well in the trying conditions. Even so, the kite took on an ominous lean to the right from time to time. As soon as 30m (100ft) of line was out, my parafoil started catching the brunt of the squally winds. At this time there was still plenty of sunshine although darker clouds were approaching quickly. The side-keels fluttered in complaint with every gust over 35kph or so. But the kite held up. Nothing folded or came apart. Mind you, the normally sedate kite took to darting and surging here and there in response to the wild air. Finally it happened - a brief fold-up occurred but was followed with a re-inflation a moment later. As the wind strength built even further, this happened more often until finally the kite ended up on the grass. It had found it's limits! This time, a few strips of wide packing tape were strategically placed to stiffen up various sections of the kite. Down at Knox Park, the breeze was gusting right up into the Strong region - it would be a good test! In the higher breeze strengths, it was certainly easier to inflate the Parafoil. With sail and drogue both in the air, the more generous side keels seemed to keep the kite steadier. At times, on a short line, the kite made some rather good line angles too, considering it was dragging a slightly over-sized drogue. So was the design ready for publication? So close really, but no. Time and again, the front end would crease up under a sudden pressure increase, either on one side or across the top. Making it look like a kid with their face up against a glass window. Either scenario would bring the kite down. When creased across the top, the parafoil would sometimes flip on it's back and continue to fly for quite a while. Albeit at a very low line angle! Launching in a less-than-smooth manner would sometimes fold up the entire front end of the kite. It seems the rake-forward of the air inlets is too extreme. Air pressure catches the edge and overcomes the stiffness of the inflated cell(s) when the gusts are strong enough. Also, using sticky tape along the seams has been ok in Gentle winds, but today was a lot windier. The next prototype will have packing tape throughout, which will stiffen up the overall structure when inflated. It worked for the Soft Sled! 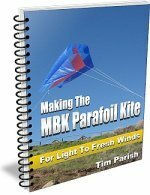 The MBK Parafoil will be going to a third prototype - but the resulting design should prove easier to launch and less frustrating to fly than the current one. I'm aiming for a kite which copes with Gentle, Moderate and Fresh winds with little fuss. Higher than it did last time anyway! Winds down at Christies Beach were ideal for giving the new parafoil a good test. Disappointingly, it still required a drogue, but I'll be trying larger keels later to see if that can be fixed. Without shifting the towing point, which now seems pretty close to perfect. The line tension was much lower than for the first prototype. This should be an advantage, allowing the kite to fly higher in fresh wind. Even with the smooth winds, launching the kite with no helper proved tricky. It seems the best approach is to hold it by the upper surfaces of the inlets, work hands around to where the bridle lines are attached then carefully fly it on the side bridle lines. By slowly slipping the lines out, the central bridle line eventually comes up tight, where-upon flying line can be let out. Slowly and with no sudden stops! The plastic on this kite is so light that a few extra strips of sticky tape will be necessary to reduce the problem of creasing near the front of the side inlets. After a few unsuccessful launch attempts with the Parafoil, the Roller floated up on about 30m (100ft) of 20-pound Dacron. Even the Roller ended up back on the wet grass from time to time. Every now and again, a gust in the region of 10 or 12 kph would come through, announced by a small stirring of tree leaves upwind. It was fairly straightforward to hold the nose end of the kite up, to let it fill with air. As is the case with most parafoils in light air, any sudden jerk on the line would tend to deflate the sail. Sometimes just enough to lock the kite into a death-spiral to the ground! Other times, a lull would result in the kite going literally belly-up before floating slowly back to earth. Eventually the line was let out to around 20 meters (60ft) but line angles were nothing to write home about. At least the kite was stable, right on the bottom edge of its wind range. It needs more breeze, and probably some tail. But indications are that this version will do quite a bit better than the first one. Even if it doesn't meet my 'no tail necessary' objective, this kite will certainly need less than the first prototype did. Breeze Failed But Rainbow Amazing! Initially the breeze had been gusting over 20kph. This would have been ideal for checking out the latest kite in somewhat stronger wind than it has experienced so far. However, when the rain stopped, so did the wind! Not completely, but it was doing it's usual trick of slowly dying away as the late afternoon sun approached the horizon. All was not lost... In the occasional puffs that came through, I managed to get the parafoil inflated and up on short line lengths. This was enough to get all the bridle legs adjusted after my latest fiddle - an alteration to the forward central keel, bringing the central bridle legs closer together. This was to try and prevent a crease appearing across the middle of the kite when fully pressured up. 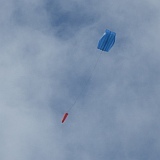 At least the kite is now ready to go straight up for a good test, the next time moderate or fresh winds are available. That last word in the title won't impress the spell-checker, but never mind... This kite has already been out a couple of times, with no real success until today. Initially the parafoil had cylindrical tubes for cells, closed at the rear end of course to make it a genuine parafoil. This, plus the towing points too far back made the kite so draggy that it wouldn't climb at all - even in fresh gusts! Today was that day, and the only further mod was a halving of the length of the drogue tether, to make the kite react quicker. That tail end was very keen to flick around at times. Gusts into the high 20's in kph enabled the dodgy Parafoil to get above the tree-tops for the first time. Flying on 100 pound line didn't help, but the winder was a bit smaller than my 50 pound one so was more convenient for the short walk to the local park. I believe 'lighter and longer' will make the next build a much more viable kite than this first prototype. Not to mention taking the 'pie slice' out of the central cell wall as well.